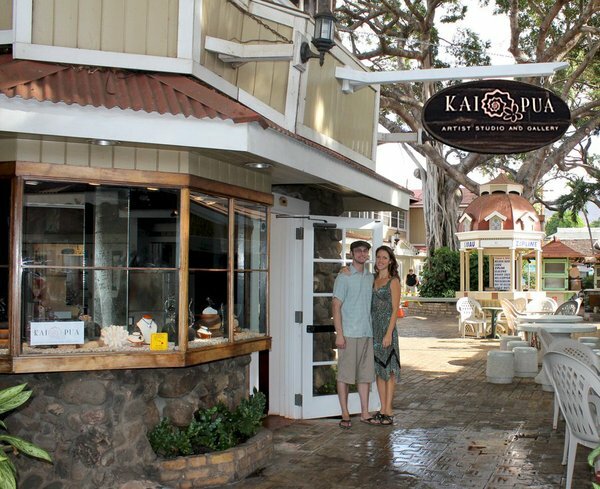 Kai Pua Art Studio and Gallery is located at 790 Front Street in Lahaina and features Oil Paintings by Anna Keay, Glass by John Lindquist, Daniel Lindquist, and Sean Price, and Jewelry by Debra Mack and Devon Mastrich. We are the only working studio on Front Street with artists creating glass sculptures, oil paintings, and delicate jewelry in the gallery every day. In Hawaiian, "Kai" means ocean, and "Pua" means flower. We like to think our gallery is where the ocean meets the flowers.... Amazing glass torched on site becomes sea life in the hands of our talented owner/artist John Lindquist and his colleagues. The walls are graced with tropical flowers brought to life by owner/artist Anna Keay. Bridging the ocean and flowers are our jewelers, Debra Mack and Devon Mastrich, creating intriguing baubles incorporating the metals, jewels, and stones of the earth. You found our website, We hope you have already experienced our gallery. If not, come visit. Check us out on Yelp and leave us a review! -John Lindquist- featured in Kai Pua Gallery from Cinemaui Studio on Vimeo. Kai Pua is a glass shop on Maui that offers live glass blowing or lampworking, Maui glass art, Original oil paintings of tropical flowers, and ocean jewelry.